Located in West Branson on Hwy 76 only 2 miles and less than 5 minutes North of Silver Dollar City. This condo is one we manage for another owner at Notch Estates. It is the same floor plan as all of ours on the main website. 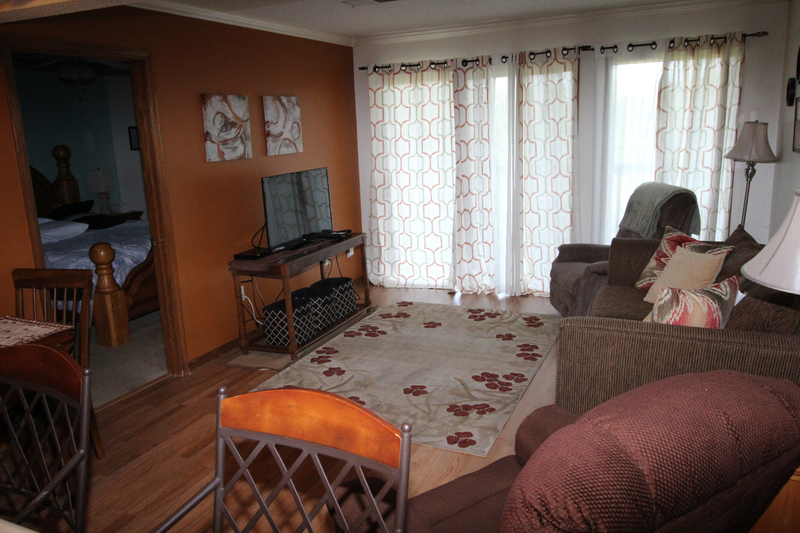 It is 2 bedroom 2 bath, 900 sq. ft. with a large deck . This is a walk in unit with no stairs. It has a beautiful view, and just a few short steps from the parking. It is directly across the street from the big pool and the playground. It has cable with flat screen TV, DVD and a VCR . It has a king, a queen, and a sleeper sofa. 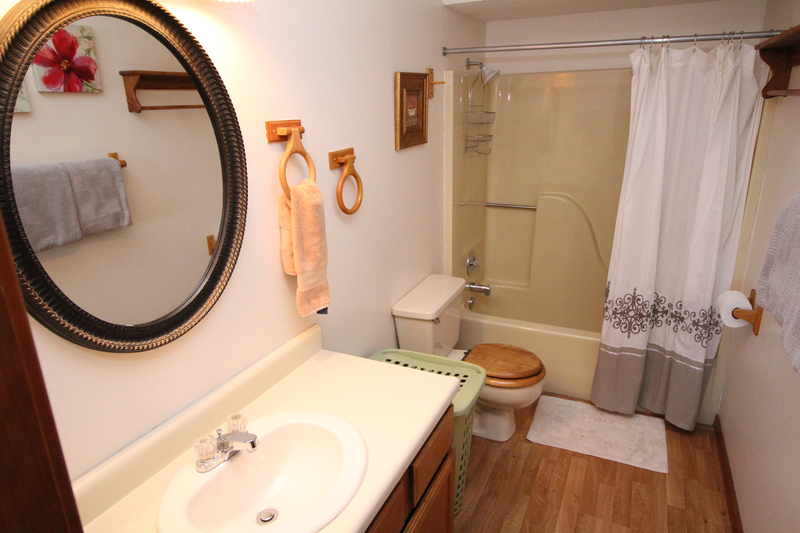 It also has a washer/dryer. 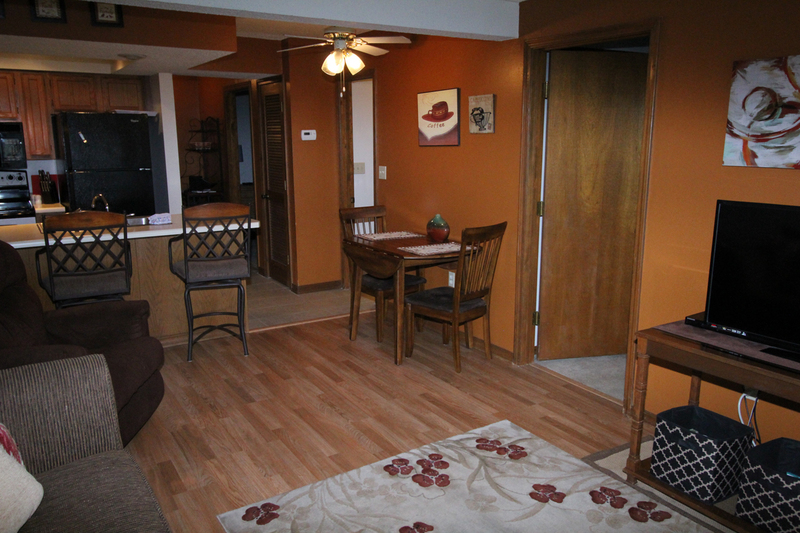 Branson's finest affordable condos where guest are invited to relax in this charming 900 sq.ft. 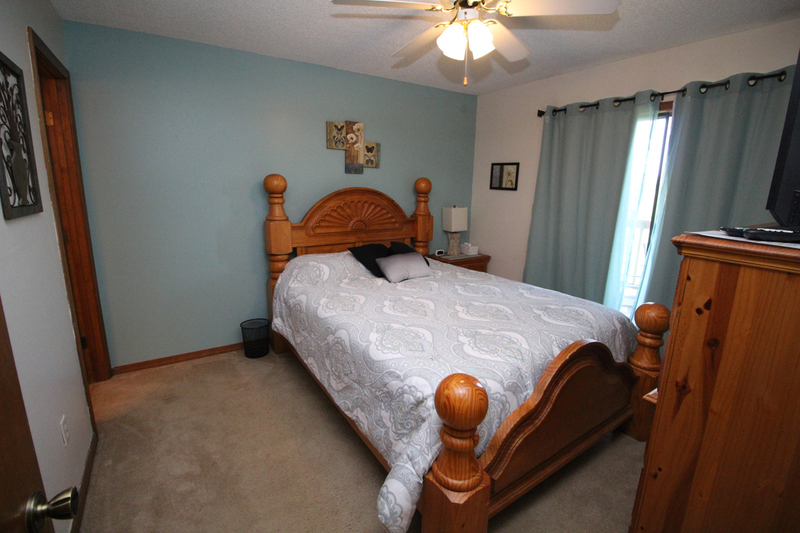 two bedroom, two bath condo in Branson. You'll enjoy the fully stocked kitchen for all your cooking needs. Elegantly decorated condo has a romantic touch. It's truly the home away from home you've been looking for. Experience a little bit of Branson while relaxing on the deck where you'll enjoy the scenic view of the beautiful Ozarks. 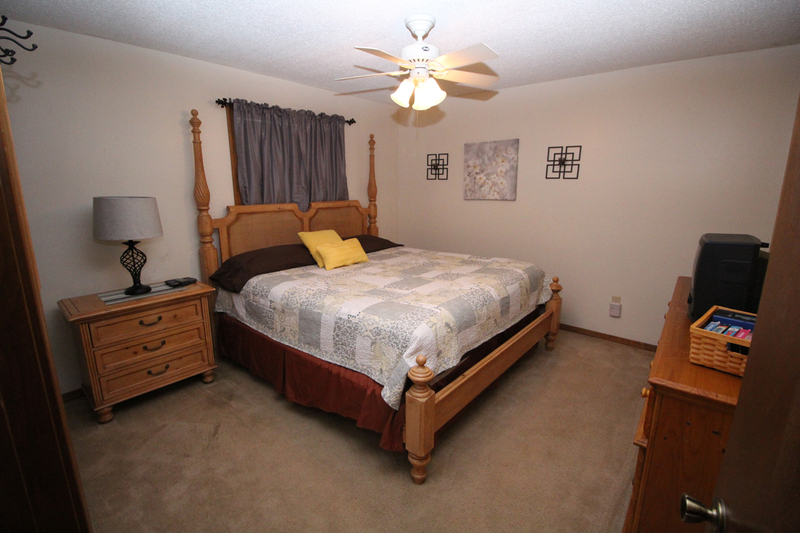 This Condo is only minutes from Downtown Branson, Shepherd of the Hills and Silver Dollar City. We are within walking distance of the Grand Palace, shopping malls, restaurants and theaters. Nestled in the heart of the Branson area you'll find this luxury condo with its great location and affordability. Sorry no pets and No smoking. Call or e-mail for reservations. For more detailed information about our Branson Condos, please check out the home page on our website where you will find descriptions for all of our condos, rates, more pictures and a links to make your reservation online. Need a good car, truck, suv or van? 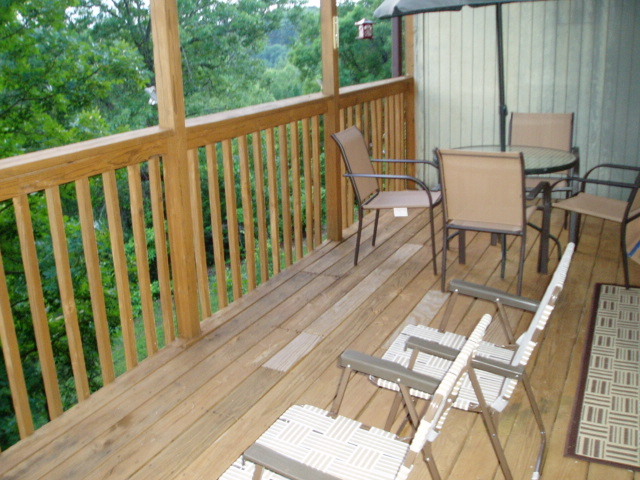 6 non-smoking vacation condos available close to Silver Dollar City, 2 bedroom 900 sq ft condos sleeps 6 guests, walkin units with great view from large deck. Vacation rentals for $75.00 / night, great rentals and priced right, clergy discount. Branson vacation rental you can afford. Enjoy your Branson Weekend! 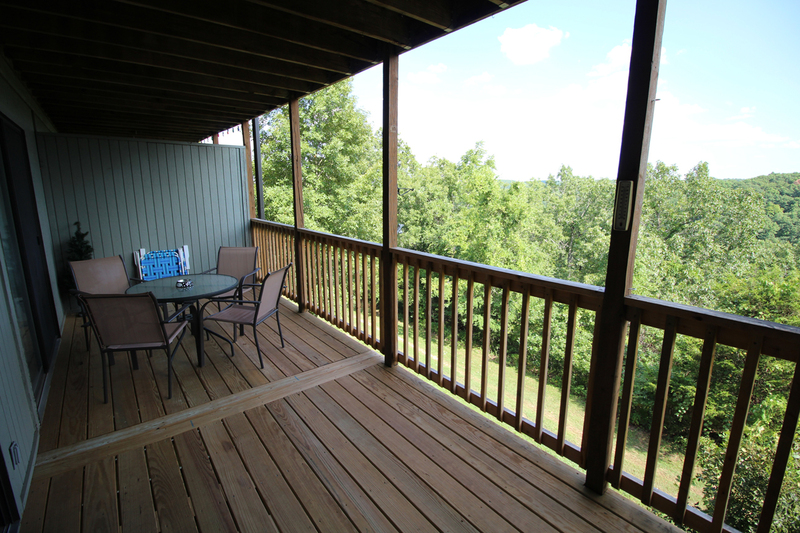 Rental Policy, Limited Refund Policy and Reservation Instructions... Branson condos for rent come completely furnished with large relaxing decks, two bedrooms, two bathrooms, fully equipped kitchen and are just two miles from Silver Dollar City. 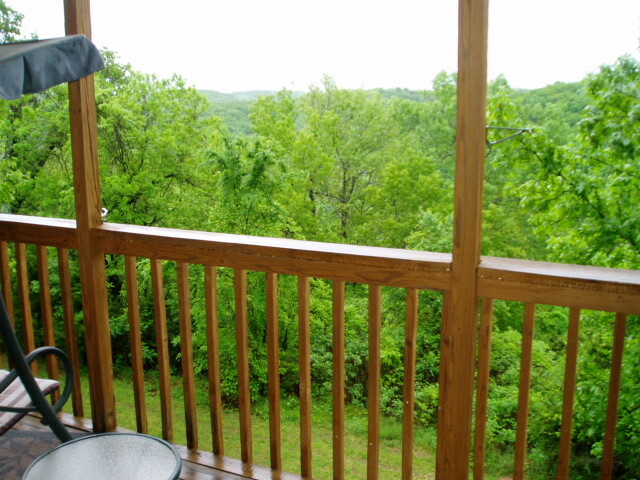 Vacation rentals in Branson offer superb condos for a relaxing break surrounded by acres of woodland and 5 acre lake in the valley below the condos. Branson weekend covers Kansas, Okalahoma, Missouri, Louisiana, Alabama, Illinois and Ohio. If you are looking for lodging in Branson Missouri check out our condos. Rent our Branson condos located at Notch Inn, Notch condos in Branson are close to Silver Dollar City and Branson music shows. 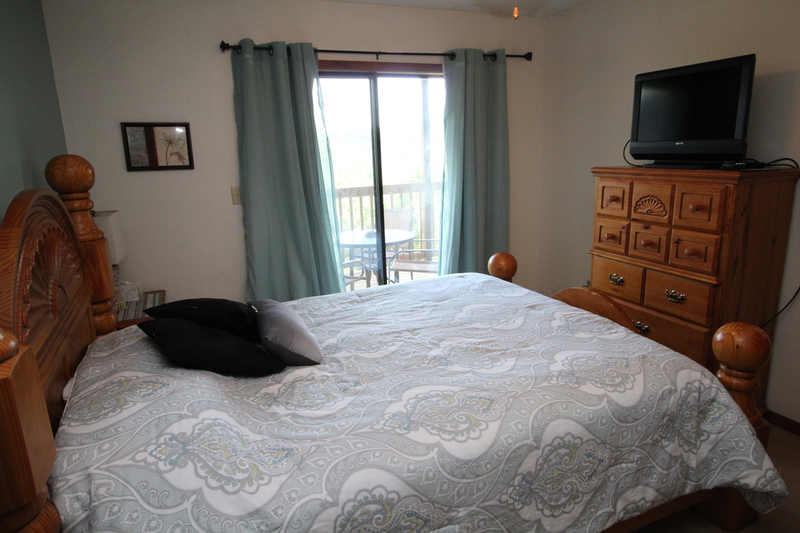 Our 6 condos in Branson will give you easy access to all activities in Branson. Five minutes from Silver Dollar City to convenient lodging. We have luxury lodging at economy condo prices. Come to Branson and enjoy lodging that you would expect to pay much more for. Our Branson condos located at Notch sleep 6. If you are looking for the best value for lodging in Branson read our guest book comments. You cannot beat our price for comparable condos in Branson at Notch Condominiums.